The Seattle metal community turned out in droves on Nov. 19 for the 40th birthday of Dan La Rochelle, guitarist for local favorite Lesbian. 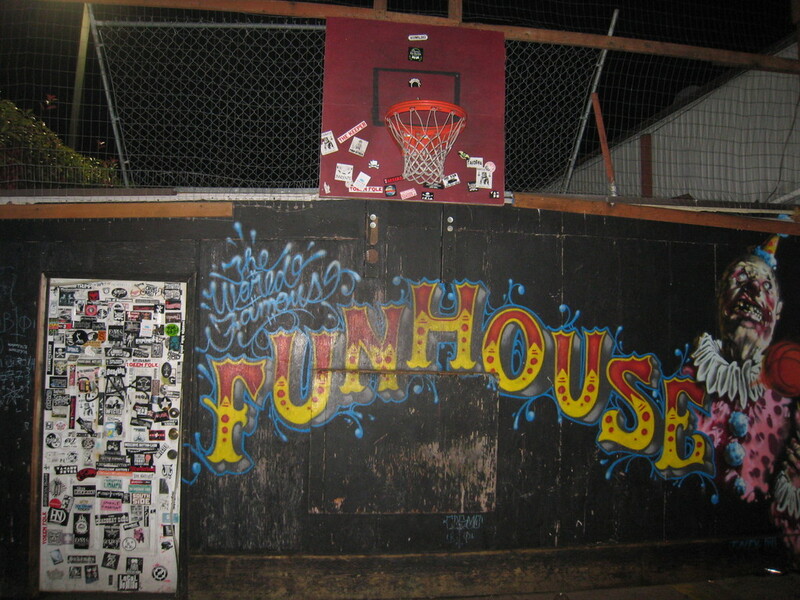 The show featured five top-notch metal bands and took place at The Funhouse, just a stone’s throw away from the Space Needle. Admission was only $7, $5 with a canned food donation for Northwest Harvest. First on the bill was Spacebag featuring members of Rorschach, Sean, and Girth. I could not find much information about Rorschach, but it seems Sean could be considered grindcore with some jazz and prog influences and Girth is experimental metal. I will say that Spacebag put on a powerful show. It’s rare that you go to a show and the very first band is nearly as good as the headliner. Out of all the bands tonight I thought this one was the closest to “doom” metal, or stoner metal, generally slower and with massive riffs. You can buy Spacebag’s releases from their Bandcamp page. 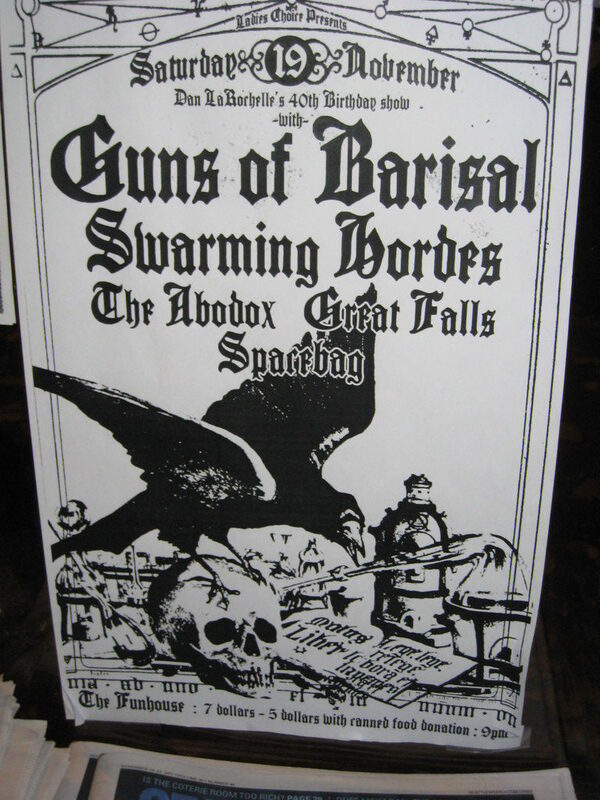 Concert poster for Guns of Barisal with Swarming Hordes, The Abodox, Great Falls and Spacebag. Nov. 19, 2011 at the Funhouse in Seattle. After Spacebag was Great Falls, which combines elements of noise, punk and metal. The band was formerly known as Hemingway and produced brutal noise as a two-piece outfit, incorporating drum machines and samples into the mix. Here is a YouTube clip of that incarnation. The band is now a three-piece and has changed to a more rock structure, although in some ways the newer material seems just as heavy. The highlight of their set for me was their ferocious cover of Black Sabbath’s “Into The Void”, which managed to capture the purity of the original while much more aggressive and out of control. The Great Falls releases can be purchased from their Bandcamp page. Next up was The Abodox, clearly an audience favorite judging by the crowd’s enthusiasm. The Abodox played their “final” show Feb. 26, 2010 at the Comet Tavern, so this was a reunion show of sorts. Their music has been categorized under many different banners, but in their current (final) state I would say they have their own brand of technical thrash metal with some psychedelic/prog influences. Guitarist Blaine Patnode was also pulling double duty tonight, as he also plays for Swarming Hordes. There are many different rhythms and grooves throughout every Abodox song, which some have referred to as “spazz-core” due to the frequent changes. To hear more from The Abodox check out their Bandcamp page, where the band’s entire discography can be downloaded free or “pay what you will”. Below is a video I made of The Abodox on this night. The mural of the old Funhouse location in 2011. Swarming Hordes hit the stage next and their cult of followers welcomed them with open arms. The band is a Seattle legend dating back to the mid-90’s. They broke up at some point (I believe in 2006 or thereabouts), so this was a reunion show for them as well. Swarming Hordes is often thought of as technical death metal, or sometimes as math metal. They are also an entirely instrumental band, which is unique in metal. It can be odd to see this type of music played without any vocals whatsoever but they make it work, and members of the band have gone on to play with many other important local metal bands. The band closed their set with a rousing rendition of Metallica’s “Master of Puppets” during which a full-on mosh pit nearly erupted. It was amusing that since their version has no vocals Swarming Hordes bludgeoned the audience with a version probably twice as fast as the original. YouTube footage is below. The headliners, Guns of Barisal, I am admittedly not as familiar with. Like Swarming Hordes they are also instrumental and very focused toward technical metal. On their official website they state their musical goals: “With a wide range of influences, including classical, folk, jazz and metal, the idea is basically about creating music that is always evolving and not limited by any rules, specific genres or scenes.” From what I heard they sounded great but I couldn’t hear that much by this time, and I needed to grab one of the last busses home. I would definitely be interested in checking out Guns of Barisal again, though. To hear more from Guns of Barisal be sure to visit their Bandcamp page.